It is Thursday evening and Andrea Monti walks in to a popular Milonga in San Francisco. She just returned from a trip to New York where she was promoting the “Argentine Tango USA Official Festival & Championship 2015” which starts on April 2 in San Francisco. Prior to her New York trip she traveled to Los Angeles, also promoting the Festival, giving interviews about the four-day event on local and national radio and television stations, the biggest and most important of them being CBS. As a matter of fact, she says, ever since CBS discovered that an official branch of the Argentine Tango Championship takes place in San Francisco, they have been eager to report about it. Andrea Monti brought the event to the United States in 2011 and has been its main organizer ever since. Now, in its fifth year, the media is beginning to take notice and approaches her. “CBS even sent a television team to the Festival and Dance World Cup in Buenos Aires to follow the couple that had won the US Championship”, she says proudly. 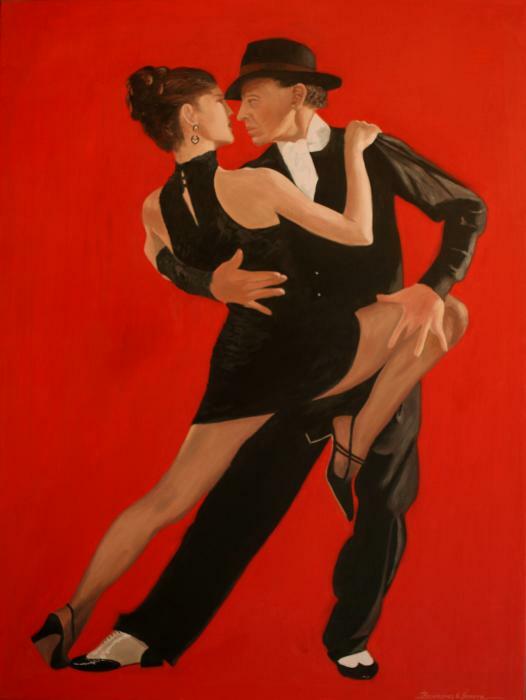 Winning the National US Championship is the ticket for competing at the World Tango Dance Tournament or “Campeonato Mundial de Baile de Tango”, better known as “Mundial del Tango”. That’s where the world’s best Tango dancers are competing against each other over the course of a 2-week dance marathon. Its US preliminary is still young and happens on a much smaller scale, but thanks to Andrea Monti’s tireless work it has gained respect in the Tango world of Argentina. Both she and her partner at the time, Hugo “Gato” Valdéz, had the idea of bringing the Argentine Tango Championship to the United States a few years ago. They had been performing, choreographing and teaching Tango for 15 years and saw how Argentine Tango was growing in popularity in the States. Andrea had also been working for the Argentina Tango Association and served twice as a judge on the panel of the World Championship in Buenos Aires. “A very exhausting experience!” she exclaims. “The judges are evaluating 500 couples. And all of them are dancing on a very, very high level. You have ten couples to judge over the course of three songs, take notes and score them.” It adds up to 45 hours of very intense work. But this was nothing in comparison to what she saw herself confronted with once she began to investigate the so-called “canon”, the Tango Associations’ rules and regulations for becoming the official preliminary and holding the Official Argentine Tango Competition in the US. “The Association controls everything”, Andrea explains. “From the specific kind of venue at which the competition has to be held to the fact that the teachers who train the dancers are not allowed to be on the judging panel – it’s all covered in the canon. We have to pay them for the rights to hold the competition in the US and for an auditor from Buenos Aires to watch over the event.” No wonder, she says, that there are only seven official branches of the Tango Dance World Cup in the world, Japan, England and Greece being among them. It is a huge undertaking which is costly both in terms of finances and time. “It costs us about $50,000 to hold the event in San Francisco”, she says. And that is just to cover the expenses. “And I bring work to the teachers”, she says laughingly. “Because so many people are taking private lessons to prepare for the competition.” It keeps her occupied nine to ten months out of the year, and for at least two weeks before the event she stops teaching to focus on the event. And then for two months after the completion, she is busy updating the website and wrapping it up. But there must be disappointments as well? What is it like, I ask her, for the couples who lose, who come in second or third? “The elimination is cruel”, she admits. “There is a lot of drama, because everybody wants to win.” Which is very different from the way dancers compete in the World Cup in Buenos Aires: “The people there come because they want to participate. It’s about becoming a better dancer and of being part of the most important Tango event in the world. But in the US, people compete because the want to win.” Consequently, there is a lot of disappointment when couples are eliminated; there are even arguments with the judges. “That would never happen in Buenos Aires”, Andrea says. “It surprised me at first a lot when dancers started arguing with the judges here in San Francisco!” But she has learned to deal with the unruly behavior of competitors and explains to them that a competition is not always fair. The judges take a brief look of the dancers, then turn to another couple and take notes, during which they are unable to watch what’s happening on the dance floor. That way, of course, they may miss a particularly good step or only see a movement that isn’t as well performed. It’s like taking a snapshot of someone’s dancing. It can never be the complete picture of someone’s dancing skills. Nevertheless, for this year’s Competition, 36 couples have registered for the Salon Tango category and 15 for the Stage Tango category. So far, Andrea Monti is counting on the attendance of 1,000 to 1,200 dancers, workshop attendees and spectators over the course of the 4-day event, similar to previous years. We will be curious to see who the winner is. Thank you Andrea B for writing so intelligently and succinctly about the efforts of Andrea M in bringing the Argentine Tango USA Official Festival & Championship 2015 to San Francisco. I had no idea how complex it is to host, promote and produce this competition. Good luck to all involved in the coming days! Previous Previous post: Hello Tango World!